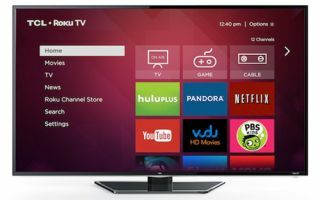 Roku TVs to launch with Roku smart TV platform | What Hi-Fi? Roku is set to launch its own Roku TVs, with the Roku Channel Store smart TV platform inside. The TVs will be built in conjunction with Hisense and TCL, two of the biggest Chinese TV manufacturers, to deliver TVs in sizes from 32 to 55 inches. Roku says its TVs will "remove all of the complicated layers and menus, and unnecessary menus and settings that plague smart TVs today, and instead provide a Roku home screen that brings together all content sources". Roku is famous for its streaming boxes, such as the Roku 2 XS, which compete with set-top boxes such as Apple TV, and also supplied the nuts and bolts for the Now TV Box. Roku TV will have full access to the Roku Channel Store, which delivers 450 channels in the UK including BBC iPlayer, Netflix, Now TV, Demand 5 and Spotify. It will feature just 20 remote-controlled buttons in an effort to simplify the navigation process, and will also work with mobile devices via the Roku app for iOS or Android.